Is a song about a latin gang war (with west side story overtures). The Media Eater and I learned that and more last night on a beautiful evening in Central Park. Mark had a photo pass and shot this photo and more. 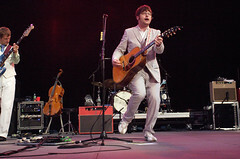 I stood back in the crowd and let the sounds of Colin Meloy’s wonderful voice and fantastic songs wash over me. He is a terrific song writer. Jackson will certainly chime in the comments with the observation that rock stars don’t wear seersucker suits. But if Colin keeps writing songs like he’s put on the past two Decemberists records, he’s absolutely gonna be a big star before he’s done.